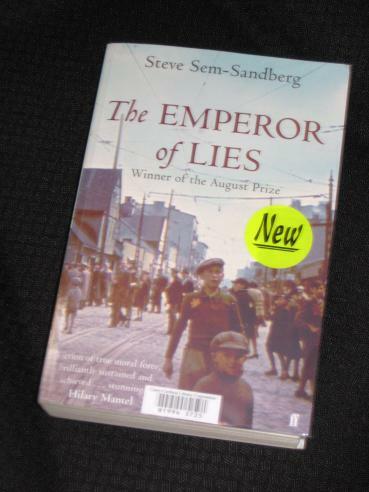 Steve Sem-Sandberg’s The Emperor of Lies (translated by Sarah Death) is a chunky novel, running to well over 600 pages, taking place during the Holocaust. The book is set in the Polish city of Łódź and revolves, initially at least, around Chaim Rumkowski, the de facto leader of the city’s Jews. Rumkowski, or the Chairman, is a crafty businessman who has somehow risen to civic leadership at a time when this leadership is vital. The occupying forces have divided the city, segregating the Jewish population in a ghetto and forcing them to work for the German war effort. Knowing that the Germans have no time for people who are not useful, the Chairman decides that the best way through these troubled times is to create an unparallelled industrial zone in the ghetto, a collection of factories which will ensure the continued survival of his people. As the war progresses though, and times get tough even for the Germans, the Chairman will have to make some very difficult decisions. The question the reader is faced with is just as tricky: is Rumkowski really protecting the best interests of the ghetto, or is he just saving his own skin? The Emperor of Lies is based on a true story, and there is no denying that the Swedish author has done his homework. However, I had a lot of trouble getting into this book, and I wasn’t the only one. Lisa explained in her post why she was unable to get through more than the first fifty pages, and I agree with her in many ways. For me though, the problems mainly lay in other areas. One was the fragmented, report-laden style of the start of the book, seemingly designed with the intention of putting the discerning reader off. Some of Sem-Sandberg’s writing is wonderful, but you have to wait a long, long time before you find any examples. While many readers may appreciate the historical accuracy and the inclusion of posters and memos, they just worked as roadblocks for me. The main issue I had with the first half of the book though was probably due to a misconception I had, albeit one encouraged by the title of the novel and the blurb. I went into The Emperor of Lies believing that the book would sink or swim depending on the character of the Chairman and the credibility of his moral dilemma, and if this had been the case, the book would have been a disaster. The man was evil, no doubt about it, and by the half-way stage of the book, I was seriously considering flinging it aside (which, as you probably know, would have been a first for me in my blogging career!). Not really. It wasn’t one which came up at all in the Shadow Panel’s discussions for the shortlist, and I don’t think anyone was upset when it failed to make the cut for the real prize. Personally speaking, the second half of this book would have put it mid-table on my list, just outside the top six, but respectable enough. As a whole though, I wasn’t impressed. It was too long, repetitive, slightly unfocused and perhaps unsure of whether it wanted to be fiction or biography. From the make-up of the final six books, I would say that the judges’ focus is on short, elegantly-written novels, and The Emperor of Lies certainly doesn’t fit into that category. Besides, while we on the Shadow Panel weren’t overly impressed with Aharon Appelfeld’s Blooms of Darkness, the real panellists obviously were, and… is it too cynical of me to suggest that there was one spot reserved for a Holocaust book on the shortlist? I've seen this book around, here in the Netherlands, too, and wondered whether I “should” read it. It didn't particularly appeal and your review makes it easy for me: I'll skip this one! A pity, though, that you didn't like it! Well, you already know I completely disagree with you about this book. I think it's brilliantly done and although it was harrowing to read, I think it's an important addition to Holocaust literature. For me, the book revolved around the moral question of whether Rumkowski was a Nazi collaborator or a “saviour” of his people. I think Sem-Sandberg leaves that question open and the reader gets to decide, one way or the other. I couldn't judge Rumkowski. I could condemn his behaviour, but not the man. I don't think there are any easy answers to the many moral and ethical questions the book poses. You know me, what puts me off, more even than this comment of yours : “Some of Sem-Sandberg's writing is wonderful, but you have to wait a long, long time before you find any examples.” (it made me chuckle) -is the word chunky used earlier in the post… I'm not saying I'm never going to read this but not right now. It wouldn't even be a good readalong choice as it is long. Judith – It does have its supporters Judith (as shown below! ), but I'm not sure it's worth the investment of time needed to get through it. I think I'm marginally more inclined to agree with Violet – I think Rumkowski was worthy of exploration, and I think there were just about enough contradictions about him to leave a question mark… that is, provided his story had been fictionalised in the right way. And that's where I think it falls down. I think it's a fascinating story, clumsily told. not one for me based on what I've read, as with Caroline I'm not saying I won't read it, if I see it cheep enough in some charity shop I'd probably purchase it, to find out what the fuss was, but I'm not going out of my way with this one. Gary – Far be it from me to put people off books, but it isn't one I'd recommend. Well done, my friend, and I'm impressed by how fair your review is. (Not, a-hem, like mine). PS I've added this to my Combined Reviews page.